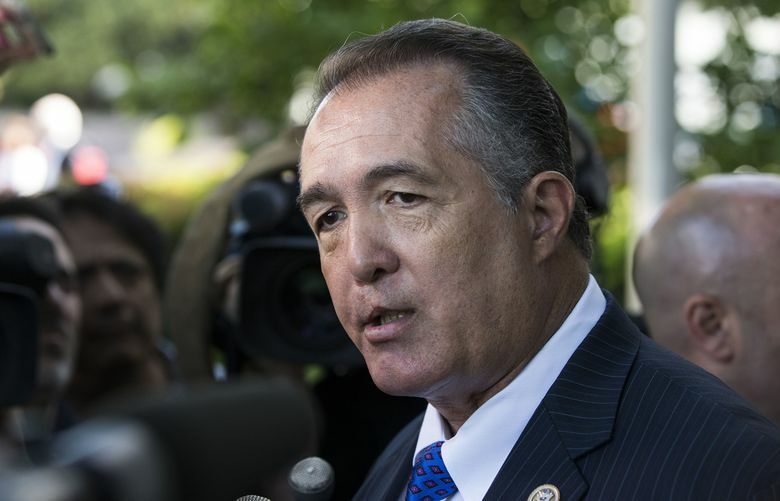 WASHINGTON — Rep. Trent Franks, R-Ariz., among the most conservative members of the House, said he would resign his seat after House officials learned he had asked two female employees to bear his child as surrogates. His resignation, which Franks said is effective Jan. 31, will end the ethics investigation. While Franks’ statement left the circumstances of the “discussion” murky, three Republicans familiar with the accusations said he had asked the employees, who worked for him at the time but have since left his office, if they would serve as surrogate mothers for his children. A spokesman for Franks did not respond to a request for comment on that claim. Franks explained in his statement that he and his wife have long struggled with infertility. After having twins with a surrogate, the couple sought additional children, he said. House Speaker Paul Ryan’s office said in a statement late Thursday that the speaker had been briefed on “credible claims of misconduct” by Franks last week, after the House general counsel was contacted about the allegations and investigated them. Ryan told Franks he should resign, and said he would refer the matter to the House Ethics Committee, his statement said. The Franks revelations came on the same day that Sen. Al Franken, D-Minn., resigned after multiple allegations of sexual misconduct and as the House Ethics Committee opened a separate probe into Rep. Blake Farenthold, R-Texas. It was revealed last week that Farenthold used $84,000 in taxpayer money to settle a sexual-harassment claim. Farenthold has denied wrongdoing in the case. Franks has served in the House since 2003 and is known as a fierce opponent of legal abortion, recently sponsoring a bill banning abortions after 20 weeks of gestation that passed the House. He is also a member of the House Freedom Caucus, a hard-right faction that has often clashed with Republican leaders. Arizona’s 8th Congressional District stretches northwest of Phoenix. Under Arizona state law, a special election must be called if there is a vacancy more than six months before a regularly scheduled election.